How to take Unhappy Customers from Hell to Heaven in 60 Seconds or Less! This contemporary customer service recovery program guarantees results or your money back. Our proven 4-step method of recovery will take any unsatisfied customer and make them loyal to your organization for life! Customers don’t necessarily want to fight, but their emotions may cause them to get angry or insult your employee at the point of contact. This is where service recovery comes into play–and where your employee can create a customer that is Loyal-for-Life! Employees forced into a confrontation with an upset customer face the most stressful part of their day. Loyal-for-Life enables that employee to quickly reduce or eliminate stressful situations. Master the advanced recovery skills taught in Loyal-for-Life! Everything you need to run the “Loyal for Life” in your own organization. Train 25 employees at once with participant guides, quality technique cards, a facilitator guide with 1 accompanying DVD, and certifications of accomplishment. Order now. Need participant packages for more than 25 employees? Add more here. Combine with participant guides to build a package for a smaller team. 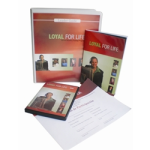 A user-friendly 134 page count page Leader Guide and DVDs for a leader (facilitator) to train a group of participants. Order Facilitator Package. Want us to handle the training? A Certified Trainer will present the “Loyal for Life” material to your group! Included in the seminar are Participant Packages. Minimum 20 participants required. Sign up now.